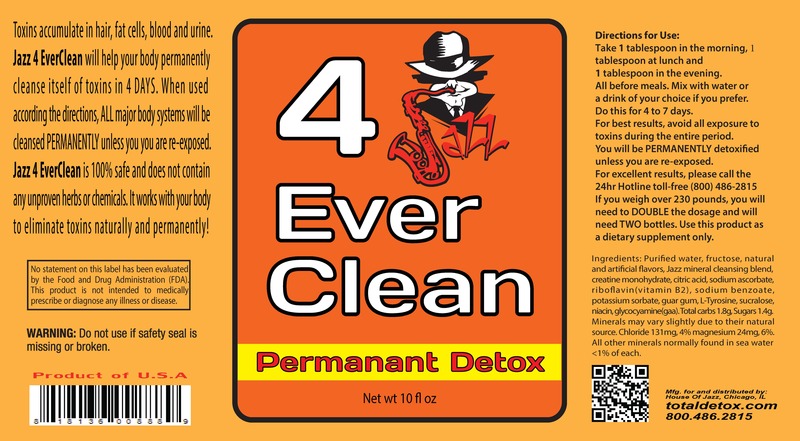 Jazz 4Ever Clean will help your body permanently cleanse itself of toxins in 4 days. When used according to directions, ALL major body systems will be cleansed PERMANENTLY unless you are re-exposed. Jazz 4Ever Clean is 100% safe and does not contain any unproven herbs or chemicals. It works with your body to eliminate toxins naturally and PERMANENTLY! 1 tablespoon in the evening. All before meals. Mix with water or a drink of your choice if you prefer. Do this for 4 to 7 days. For best results, avoid ALL exposure to toxins during the entire period. you will need to DOUBLE the dosage and will need TWO bottles. I have been using Jazz products for a very long time. And I live by them. Their products have never failed me. I will never use or recommend any other brand. I live in this House of Jazz. Really does wat it says!!! I started using the product monday around lunch time and by saturday nite I'm completely clean. I was kinda on the fence if it wud work cuz I've been smoking for about 11yrs. But wow, new job here I come :) and dnt worry if u smoke cigarettes it won't effect results. BUY THS PRODUCT!!!!!!!!! I bought this thinking it was a scam. I am not an employee of this site or company. I followed the directions verbatum. And in 5 days took a home test and passed. Had smoked a qtr. oz. of weed for 2 straight weeks prior to use. This product really works! I could not be happier as I am looking to change jobs and need to be clean for pre-employment test! BUY!